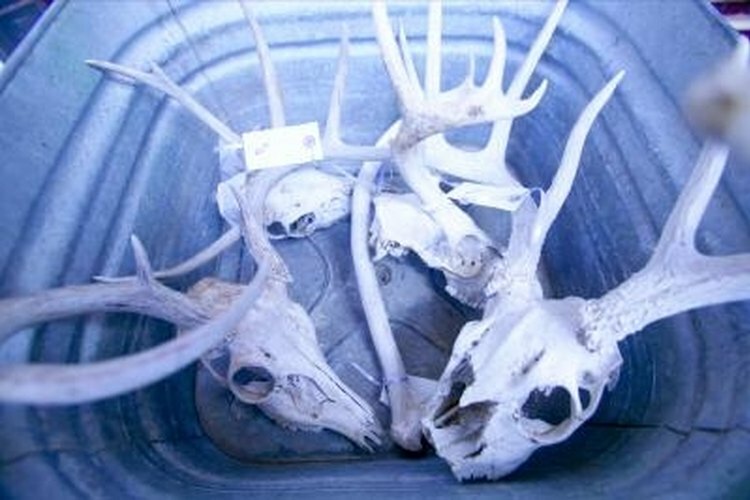 Preserve your deer skull yourself with ease. Rather than spending a lot of money paying a taxidermist to mount a deer head, you can make an attractive and inexpensive skull mount yourself to commemorate your hunt and display your trophy. Once you've skinned the deer and removed the head, you can boil the skull and wash it with boric acid to remove leftover tissue, blood and fur. While washing and cleaning the deer skull does take some time, it is cheap and fairly easy labor. Skin the head and remove as much flesh and fur as possible with a knife. Remove the brain, eyes and glands from the skull through the eye sockets and the back of the skull. Scrape off as much as you can to make the cleaning process easier and more efficient. Cover the skull, inside and out with boric acid. Use either a concentrated powder form or in the form of Borax powdered detergent, which contains boric acid. The acid soaks up moisture and dissolves left over cartilage, tissue, blood and organic matter. Wear rubber gloves while handling the skull with acid to prevent skin irritation. Rinse the skull with scalding water and scrape off the remaining boric acid. Boil the skull in a large pot or container. Mix in bleach or household degreaser detergent to remove grit and oils from the deer. Remove the skull from the water periodically to check its progress. Use tongs and be careful as the skull may contain pockets of boiling water. Repeat Steps 2 and 3 until the skull is white and free of any organic matter that may attract insects and bacteria. Depending on your thoroughness, it may take anywhere from one to 12 hours to get it fully clean. Mount and display the skull to your taste and budget. There are many home-mounting kits available, or you can simply hang the skull on the wall or on a board. Only use boric acid on a deer skull - other acids can dissolve bone quickly.